This program is kindly supported by a grant from the Embassy of Finland to Kiev. The Programme for Development of Female Entrepreneurship aims to popularize innovative entrepreneurship for women and to provide them with the necessary knowledge, expertise and support. The project also aims at creating a community of new as well as experienced business women via mentoring, encouraging communication and creating a place for finding sound advice or problem solutions. The programme is supported by the Embassy of Finland in Ukraine and realized at the IHUB network. The project is operated by a non-profit organization Seed Forum Ukraine Foundation. The Programme for Development of Female Entrepreneurship is aimed at increasing the popularity of doing business among young women and assist women entrepreneurs via a 3-level comprehensive training program and business incubator services. The project also aims at creating a community of new as well as experienced business women via mentoring, encouraging communication and creating a place for finding sound advice or problem solutions. The project will be implemented through five main activities: awareness raising – promotion of successful women entrepreneurs as productive members of society and role models for future women entrepreneurs; training and educational activity – a threefold comprehensive gender sensitiv business educational programme for aspiring female entrepreneurs; provision of business incubator services – six months long resedentship at iHUB for 15 most promising women run startups; establishing and running the Mentoring Network – identification of successful business women in Ukraine and internationally to support aspiring women entrepreneurs in personal growth in the professional environment; creation of community of women entrepreneurs – helping women to rapidly locate partners or employees or quickly solve everyday problems as well as big challenges through discussion with experts and those who have experienced the same issues. The Development of Female Entrepreneurship Programme is aimed at women interested in starting and running their own business regardless of their age. Our focus are both women who already have their business idea or even are running their own business and those who would like to start one. Due to the complicated political and economic situation, our particular interest lies in getting involved with socially vulnerable groups, such as unemployed, internally displaced people form Crimea and Donbas regions who are willing to launch their own business in their new place of dwelling. The latter include both women who had to leave an active business and want to start a new one and those who see self-employment as a way-out considering a high rate of unemployment within IDPs. The activities take place across the iHUB network of centres – in Kyiv, Lviv, Vinnytsia and Chernihiv. Depending on the demand of a particular region, the educational part of the project either takes place in person or via video streaming from Kyiv. 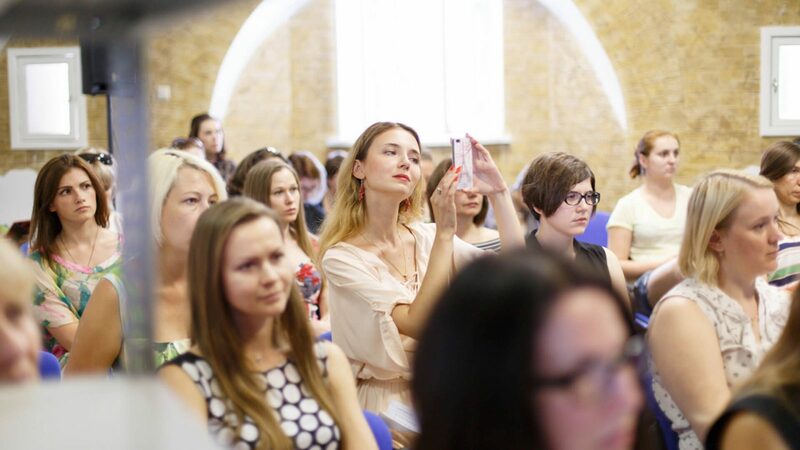 As a number of Seed Forum events will be provided online so that women from any region of Ukraine will be able to participate in them if they have access to the internet. Informational days were held to raise the awareness of gender disparity issue in SME sector in Ukraine. Successful female entrepreneurs were invited to participate in a dis-cussion table to showcase a positive image of women in business, motivate and inspire female entrepreneurs. As of the date of writing this report over 800 women attended the educational programme, which consists of three levels: initial, basic and advanced. The initial stage focuses on starting a business – getting from an idea to a business plan. Second, basic stage concentrates on the startup itself – providing basic knowledge for the first steps in successful management of a startup. Third stage is for a formed company and entails more specialised knowledge for the development of a company. Specified topics such as finance, marketing, accounting have proven to work better being taught not as a whole subject in relation to SME but rather the aspects of each topic that are most useful at a particular stage of the startup – be it starting, managing or growing. We have adjusted the programme to contain theoretical knowledge and practical trainings that will maximally encourage intellectual and emotional involvement of participants at every stage of running their own business. So far 9 female founders or co-founders of startups have been awarded iHUB residency in three centres across Ukraine – Kyiv, Vinnytsia and Lviv. Here they are exposed to the entrepreneurial environment and various events and training modules that are organised by Seed Forum and iHUB, as well to the counselling services to be provided directly by the iHUB team. 30 mentors from various industries to provide expert advice and counselling to selected female startups. 450 online community members, active participants and alumni of the educational programme, who comprise a supportive network of driven and innovative women willing to start their own business. It is a platform for friendly, positive and gender-sensitive communication, advice, experience-sharing and support amongst women. The project was launched in June 2015 and is ongoing. The best ideas deserve best conditions. That is why 15 female founders and co-founders of startups can been awarded 6 month free of charge iHUB residency on a competitive basis Here they are exposed to the entrepreneurial environment and various events and training modules that are organized by Seed Forum and iHUB, as well to the counseling services to be provided directly by the iHUB team. Starting your own business, it is very important to have not only a faithful partner but also a wise mentor that can put you on the right track. By creating the mentors network we promote knowledge and experience sharing, opening new opportunities to get the highly qualified advice from expert. Restarting existing female owned businesses that were contributing to the economy before the crisis displaced them from the east. Improving those businesses through education and mentoring so that they expand with associated increase in employment, revenue and a move towards higher value added products and services. Establishing a community that will provide knowledge sharing between existing businesses and new female entrepreneurs so that valuable business experience, knowledge and new ideas can be pooled. This will further benefit the established but traditional companies by helping them to develop more competitive (value added) products. Additionally, it will offer strong early support to emerging businesses who lack general business experience; this will lower their risk of early failure and improve their chances of long term success. Establishment of an international network of female business mentors for Ukraine who can offer valuable international business experience and potentially access to wider markets. Formally establishing such a network is likely to become a platform for communication, informal activity of which will exceed the duration of the project.